If you don't know her for her role as Emily on everyone's favorite guilty-pleasure television show Pretty Little Liars, you've probably seen her on Instagram. Twenty million followers subscribe to the actress's travel, fashion, and beauty posts, a curated side job that's earned Mitchell the title of "influencer" on her résumé, inked right above her latest role as global creative brand ambassador for Buxom Cosmetics. "It was a really awesome fit," Mitchell tells us of the partnership, "and when then they asked me to be the global creative brand ambassador, that was something that I was excited to be a part of because that means that I can help out with the different photo shoots and be more of a helping hand in the creative process. Just recently, I tested one of the newer products, and it was really cool to have a say in it and be a part of the group." 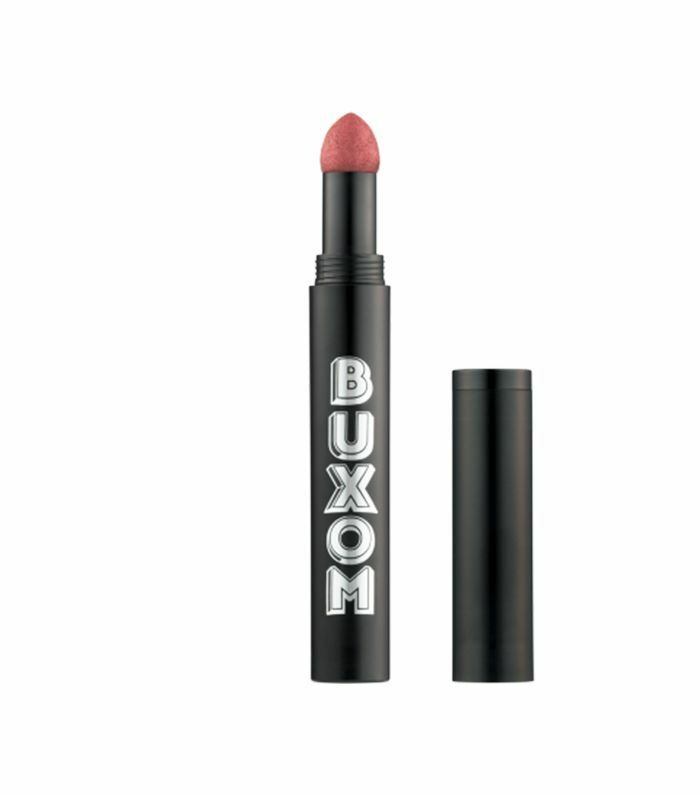 Can you tell us more about Buxom's latest launch, PillowPout Creamy Plumping Lip Powder (available July 19), and how you like to wear it? I love this lip powder because it's really unique in the way that you apply it. With the lid, you just snap it on and twist it a couple of times, and then the powder from the lid gets on the applicator, and it's just the perfect amount. I also think that the way it goes on the lips is different from your lip glosses or lipsticks that we're used to. It's perfect because it gives it that blotted look that's fresh and doesn't overpower your lips and gives it such a great kind of pigment. It also has a great tapered sponge tip that gives great coverage corner to corner. Do you often do your own makeup, and if you do, what are some tricks you've learned to help it look flawless? I do my makeup when I don't have the luxury of having somebody else do it, but to be honest, the glam process for me is the most fun part, so if I'm getting ready for an event, there are two, sometimes three hours of getting with the whole glam team and it's so much fun. We're eating, we're listening to music, we're dancing around—it's not just straight work; it's really fun and we talk about the look and what we want to do with the makeup and the hair, so it's a whole collaborative process. I really enjoy that, but on the days where I can't have glam (unfortunately), I do my own makeup, and it's also really relaxing, in a way. I put on a playlist, I'm in my bathroom, I get it all set up, and I think, over time, because of the different makeup artists that I've worked with, it's helped me with my own application of makeup. When I was younger, I would use my foundation and then maybe go in with a little bit of bronzer. I had no idea about highlighting and using [a lighter] color under your eyes and above your cheekbones to make those areas of your face pop. Coming from working with some of the best makeup artists, it's been really interesting to see their techniques, you know? They all moisten their Beautyblender, and the way that they blend is like a whole thing on their own. I try and do what Ariel [Tejada] and Patrick [Ta] do—I haven't gotten there yet, but it's like a really light touch and it's, I mean, the amount of times that they've used a Beautyblender on my face, I would love to count it. I love the Buxom Luminizer. I mix that with my foundation, and for summer, it just gives it an overall beautiful glow, and then you can go in after with the highlight for a little extra, but I always love mixing that Luminizer with the foundation just because I think it's perfect—it just adds that little bit of sheen. I also love bright lip colors. I love tan, golden, dewy skin for summer and just a light mascara. I'm doing a less-is-more [approach] for the summer because especially when it’s hot, you don’t want to have makeup melting all over your face. You have a massive following. What do you think makes you so followable? Oh gosh, I don't know! I post photos that inspire me—I post a lot of destination and wanderlust photos on my feed to mix in with the photos of myself, but it's a fun process. Taking photos for my Instagram is also something that's a collaborative effort. Whether I've had glam done or my outfit styled, it's fun. It's like mini photo shoots all the time, and I always love that because I love getting to work with so many different creatives. When I'm on vacation, my photographer is like, "Oh man! This is a cool area! Maybe do this," or "You should grab this bag," and, you know, it's just fun to get to work together on something like that. But overall, I mean, those shots are just from different places I've traveled to and I think that's one of the best things about social media, and specifically Instagram, is getting that inspiration and getting to add on to your bucket list from seeing where other influencers and travelers are going. Do you ever feel the stress of having this new title of being an influencer? Do you feel pressure to maintain a certain look or status? No, not at all, because everything that I'm promoting and talking about or everything that I'm wearing is all the stuff that I genuinely love and I'm using, so I don't ever feel like it's anything that's forced. I would never do something like that because it's not real. If I'm talking about a product, it's because I genuinely use it and like it, you know? I think that's something I'll always try and do because there's nothing worse than being a fan of somebody and liking their style and not knowing if they're really using that product or whatever it is. So I think that, for me, it's about living my life as authentic as possible, and through that, great, then I have some photos, and that's what people can see, but I wouldn't want it to be anything else. I think the pressure of having to maintain a certain identity when you’re trying to be something that you're not, that's a lot of pressure to keep up. If you're being authentically yourself, you don't even have to think about it. Have you had an insecurity that you've been able to turn into a positive? Oh my gosh, I have so many things when I was younger that I was insecure about, like having super-wavy hair, being really tan, and so many different things when I was growing up. I wanted to look exactly like all my best friends. They had blue eyes and blonde hair and a fairer complexion, so growing up, I'd dye my hair, I'd wear contacts, I'd stay out of the sun—everything in my power that I could do that was the opposite of what I was born with. Over time, I was like, don't try and hide or change who you are and what you look like. I think that's the beautiful thing about everybody is that we're unique. You have great hair. Please tell us all of your secrets. Honestly, it's about air-drying as much as possible. I really wish I could give you a product, but any time I'm not working, I don't touch my hair. I brush it once when I get out of the shower, and that's the last time it gets brushed until I get back in my shower or somebody else does it. I don't touch my hair ever. I don't put anything in it—maybe it's a little coconut oil here and there, but I really try to leave it alone. I've had for seven years someone using hot tools in my hair every single morning, but I think the best thing you can do is just leave it alone. Let it air-dry, put a little bit of coconut oil on the ends, and you're good to go. Up next, take a look at Shay Mitchell's top five favorite beauty products.